In the Hilosky House, we are all Yankee Fans! In fact, we often live by the motto that in a perfect world, everyone would be a Yankee Fan! Today marks the opening day of the Yankees 2014 season, and Derek Jeter's last season. Derek Jeter is the player that John and I will talk to our children about the way my dad always talked about Mickey Mantle. In fact, Derek Jeter is the player that made my sixth grade self actually start paying attention to all those baseball games my dad watched. 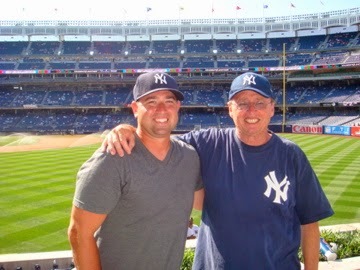 John was even lucky enough to be at the game when Derek Jeter got his 3,000th hit! So today I felt that I needed to do a little Hilosky Family Yankees Baseball Tribute! In 2009, when John and I were getting married, he ordered t-shirts for everyone with a Yankees NY and our names and wedding date! We still have the shirts! Luckily, we als have a few small cousins who have passed down their shirts to our girls! 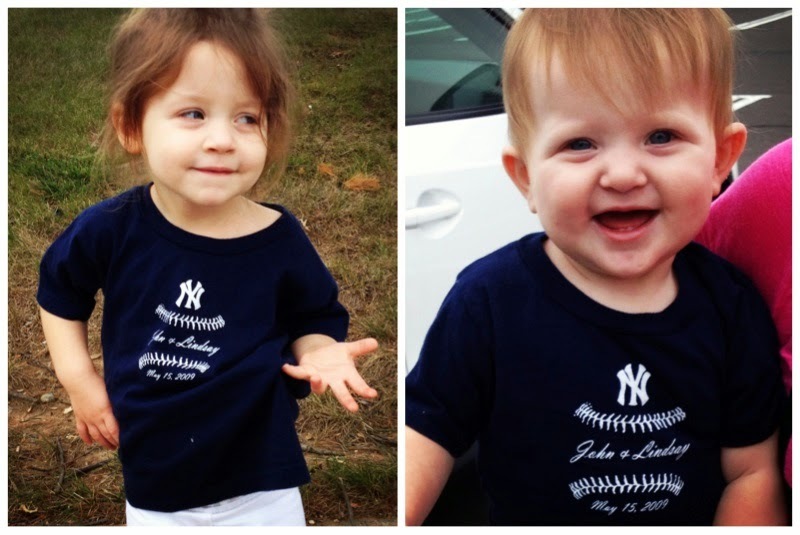 Lacie and Blakely in 2013 wearing the John & Lindsay shirts! Lacie and Blakely rocking the shirts again today for opening day! John wore that same shirt for the birth of both Lacie and Blakely. 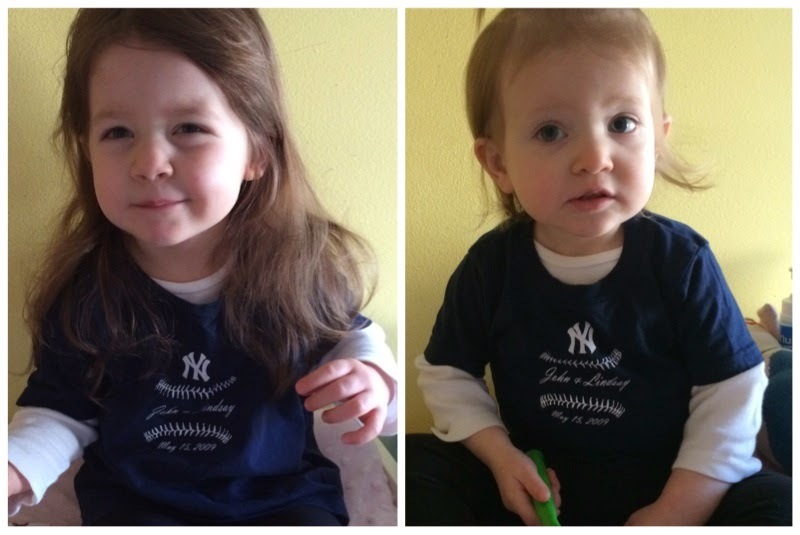 I have no doubt that if we are blessed with any more children, John will again wear that exact Yankees Shirt! To celebrate our first wedding anniversary, John and I went to a Yankees Game! The gift for one year is paper - so we did tickets! It was so cold that day that I had to buy the long sleeve shirt I am wearing about halfway through the game! 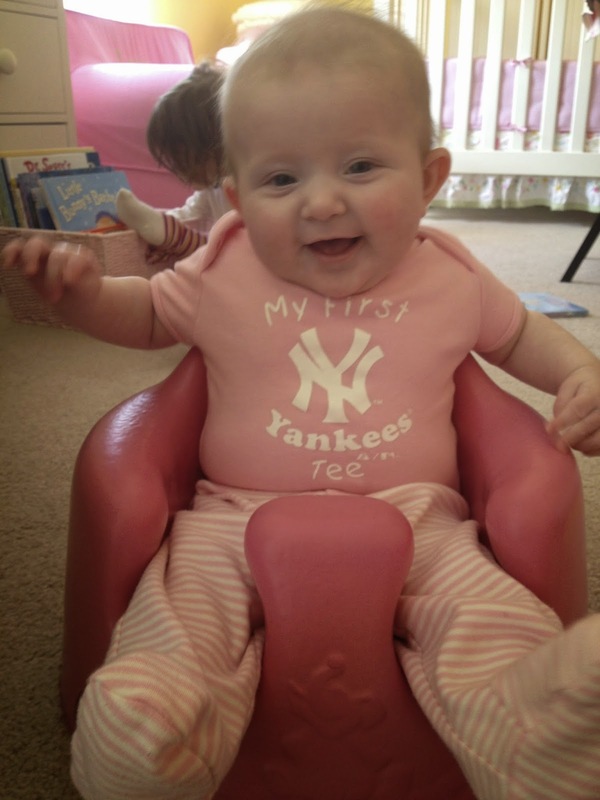 Lacie Jane rocking her first Yankees Tee at only a few weeks old! Sweet B in the same shirt at 4 months old! 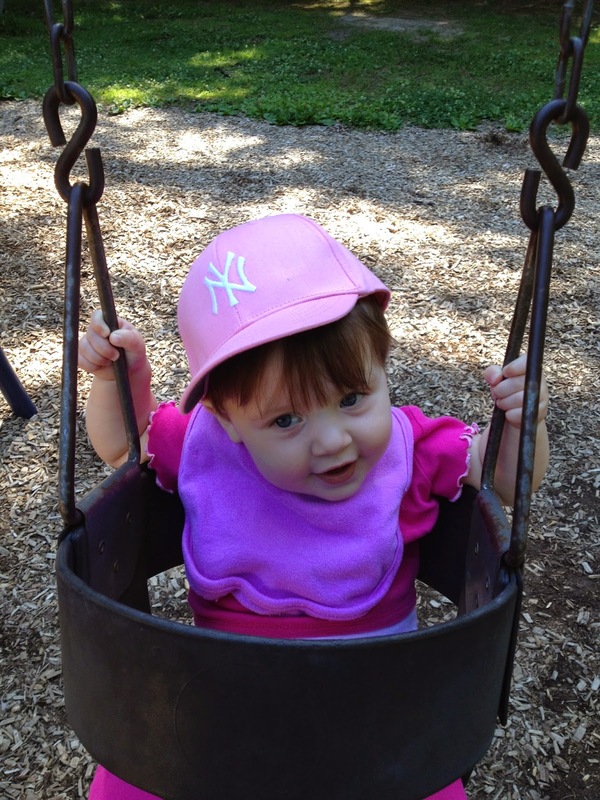 Lacie wearing her first pink yankees hat....when she actually kept hats on her head! A rare picture of me in a hat! This was last summer, right after July 4th! Lots of Yankees Baseball Love in our house!